Do you like to wear a cape? Are you a persistent do-gooder? Are you somewhat reserved and easy going? Are you an intelligent geek? Do you like hi-tech gadgets? Do you have a dark personality? Are you VERY comfortable with your body? Do you value independence and privacy? Do you ever wear a pushup bra? Do you like to be in the limelight? Are you good at acrobatics? Are you a little naive? Do you have hidden strength? Do you often hurt people without realizing it? Do you move a lot? Are you extremely talented in only one area? Will you sometimes go too far to get your way? Do you have one object that you highly value? Do you get in many physical fights with girls? Do you use people to get your way? Do you like bad boys(or girls)? Are you much of a drinker? Have you achieved a lot from hard work? Copy your superhero results to your web page when finished. 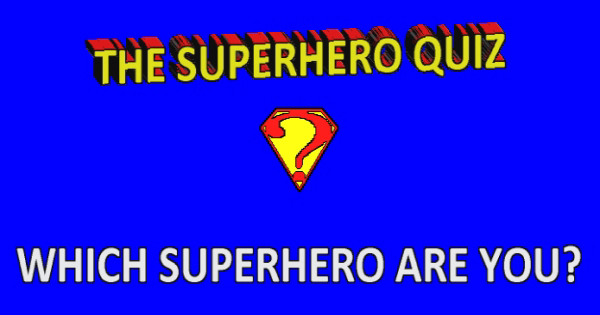 If you really are a superhero then you are able to read this. This super hero personality test, quiz, survey will help you to see which popular superheros you most resemble. Answer the questions honestly. These superhero's have been in comic books, movies, and TV shows. DC Comics: Superman, Supergirl, Wonder Woman, Batman, Robin, Catwoman, the Flash and Green Lantern. Marvel Comics: Spider-Man, the Hulk and Iron Man. You may ask yourself, "Which Superhero am I?" Take the quiz to find out the answer. Which is your favorite superhero? What are the best superheroes? Do you know which superhero is the most popular? Do you know which comicbook is the most popular? If you like quizzes copy the results to your myspace, xanga, hi5, orkut, blogger or livejournal blog.